Entering Ngoc Chau Garden (116 Ho Tung Mau, D1) is like walking into a Vietnamese home, specifically the owner Mr. T’s family’s home. Mr. T grew up in a traditional household in southern Vietnam with his grandmother’s cooking being a staple of his childhood. 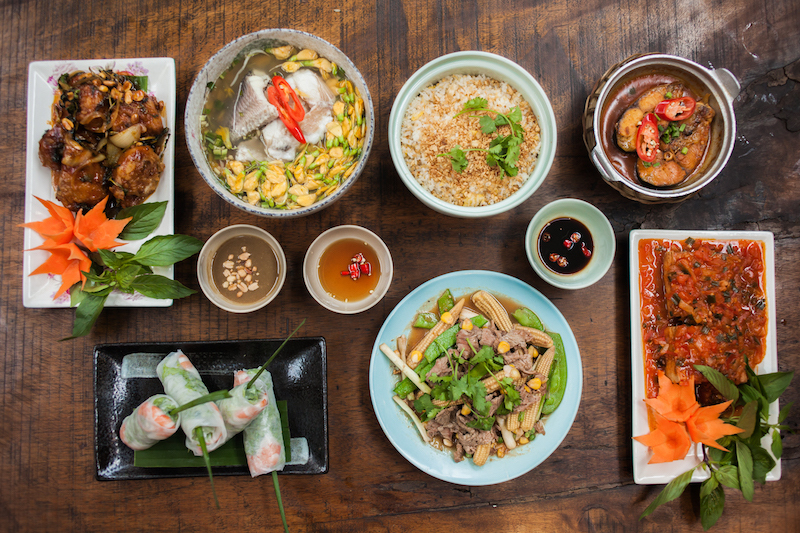 Named after his younger sister, Ngoc Chau, the restaurant, opened in September 2015, aims to create a wholesome Vietnamese experience, where customers come to enjoy the atmosphere, the traditional decor, and the friendly service as well as the delicious home-cooked dishes. The manager of the restaurant, HV grew up in central Vietnam and has been working at Ngoc Chau Garden since it opened, like many of the staff here including the head chef. 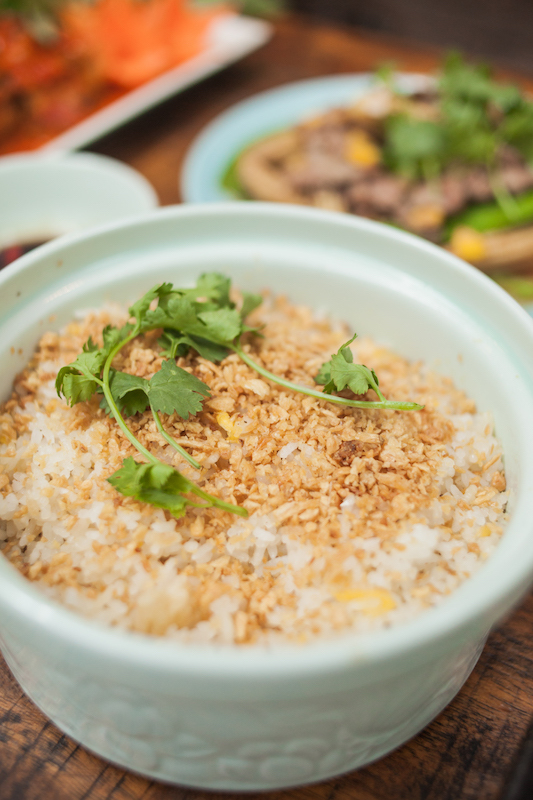 The menu consists of over 100 dishes that are freshly cooked to order, including many southern favorites as well as dishes inspired by northern and central Vietnam. 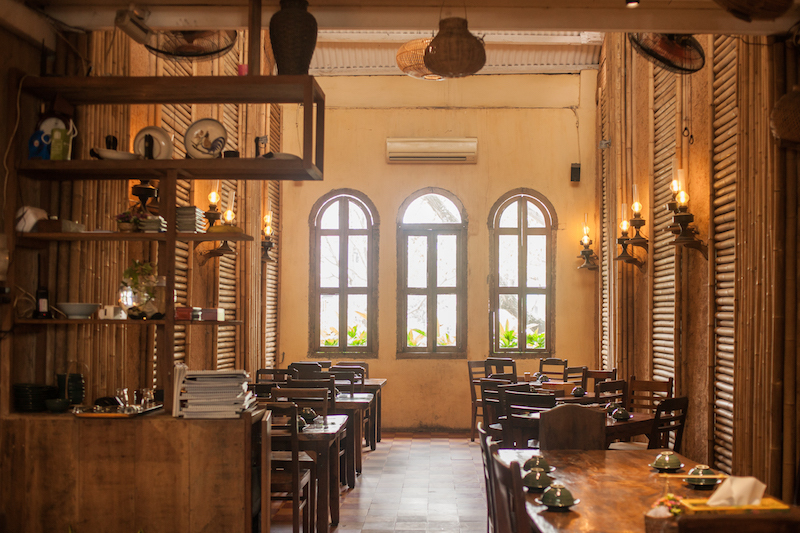 “When people think of Vietnamese food, they think of bun cha and pho, but it is not complete without staple family home cooking,” says HV, as we sit in one of the four seating areas chatting over a glass of iced Jasmine tra da. Spread over three levels in rooms framed with bamboo-paneled walls and furnished with dark wooden furniture and fishing baskets that hang from the ceilings, Ngoc Chau Garden can comfortably seat 150 people at any one time. The third floor is a mezzanine floor that can be hired for private functions and parties. 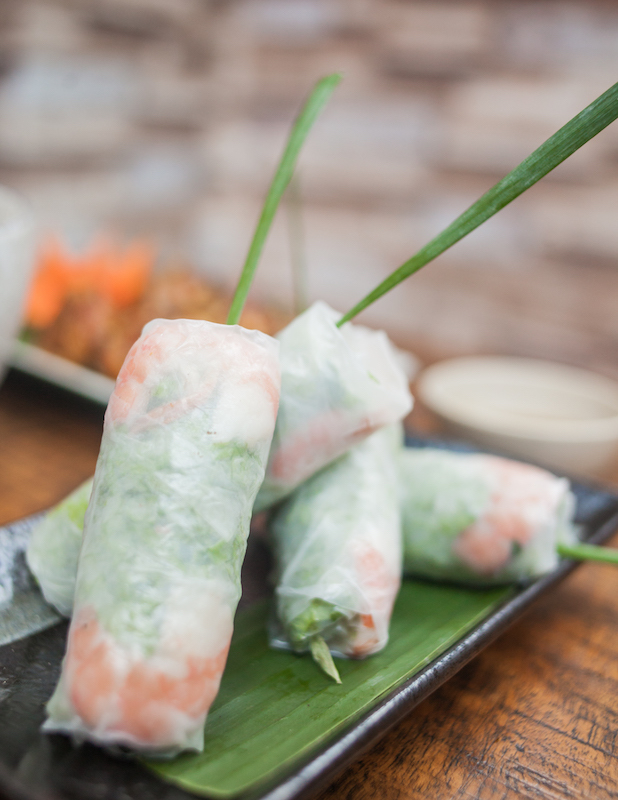 Each dish on the extensive menu has been photographed especially and appears next to the Vietnamese, English and Japanese descriptions, which accommodate the majority of their customers. “The food and the photos of the food are the same,” says HV as she explains that they remain transparent with their customers and will also tell them if they think they are ordering too much food for the number of people. As the food arrives on banana leaves positioned on traditional woven plates, it does not disappoint on presentation. The Vietnamese grilled pork patties with citronella (VND125,000 for 4 patties) is a dish inspired by Hue. To make this dish, pork minced with garlic is molded onto and cooked onto sticks of lemongrass, which subtly infusee the meat with the flavor. However, the fun comes when preparing the dish. HV demonstrates by placing lettuce, carambola (a sour Vietnamese vegetable), mango, pineapple, Vietnamese basil and finally the pork into rice paper and wrapping into a roll before dipping it into a spicy, peanut sauce. 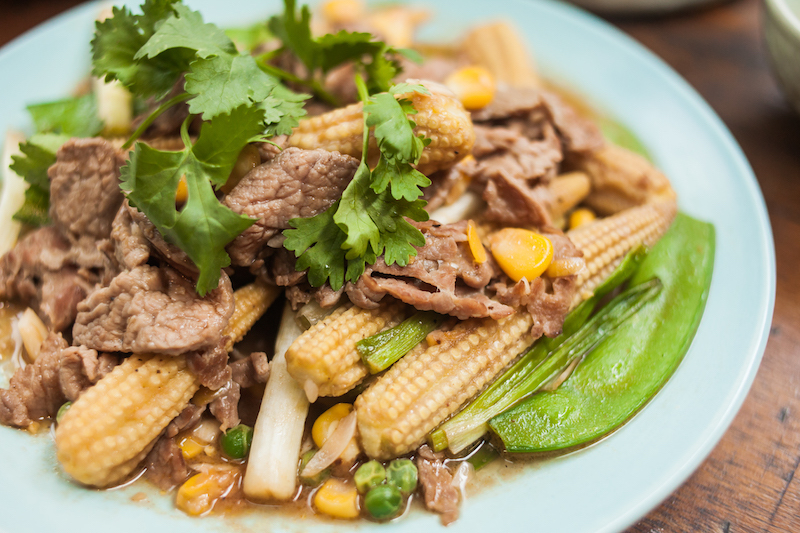 We also sample Ngoc Chau’s stir-fried beef (VND100,000), which is deliciously tender and bathed in a juicy, pepper sauce with baby corn and green beans. 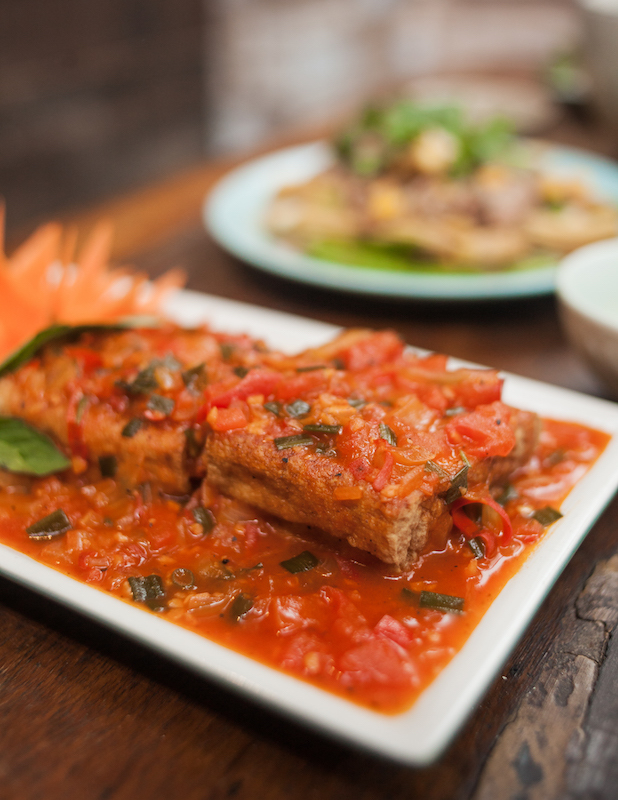 The vegetarian menu does not punish anyone for being meat-free with exciting dishes like stir-fried Tonkin flower with garlic (VND80,000) and vegetarian sour soup with Egyptian Riverhemp (VND80,000). Don’t be afraid to wash your meal down with Ngoc Chau’s homemade wine (VND75,000 per glass) brewed especially by Mr. T’s mother and left to age for five years. There are three flavors to choose from: strawberry, passion fruit and dried banana. This is no ordinary wine as it comes with a 20-30 percent strength. 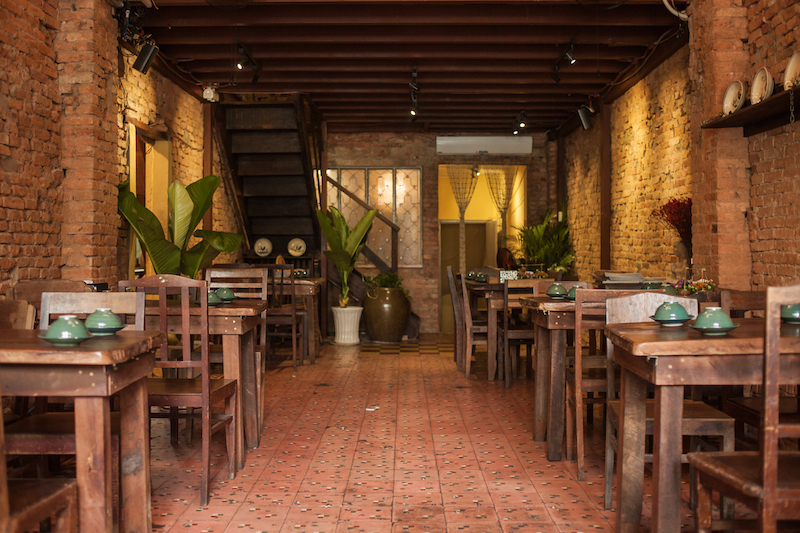 Ngoc Chau Garden also makes a wide range of their own teas, smoothies and juices as well as serving local beers and a wide selection of local and international wines. With the warm, approachable nature of this restaurant, whose staff are just as happy as their full-bellied customers, there’s no reason why this family-oriented dining experience won’t continue to grow. Seems nice. Need to visit once.